FULTON, NY – The production staff of the new musical ‘Robbin Hood’ is not pleased with the reviews that have been published in the Boston papers. They attribute the terrible reviews to the horrible performance of their leading lady and fear that their show is doomed and will never be able to open on Broadway. 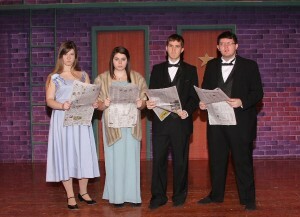 Pictured here is the show’s lyricist Georgia Hendricks (Kaitlyn Kinney), producer Carmen Bernstein (Kennedie Coyne), composer Aaron Fox (Logan Carvey) and major investor Oscar Shapiro (Stephen Heywood). 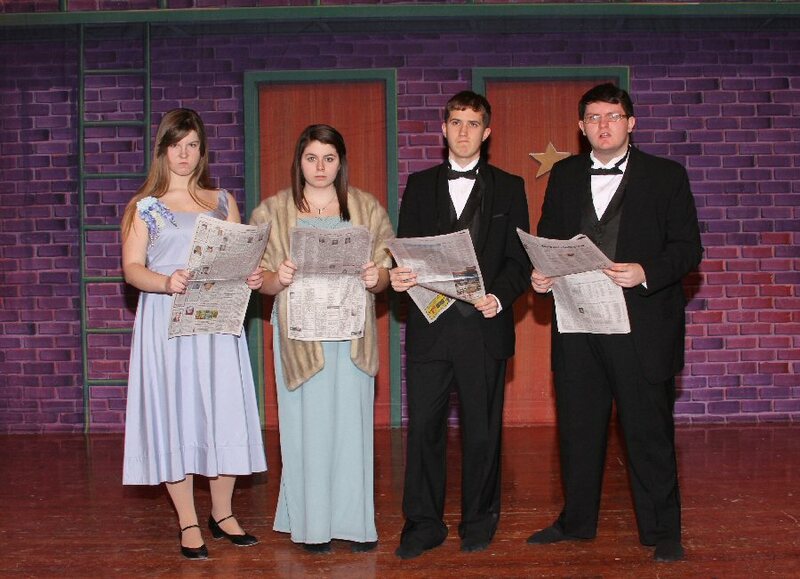 The scene is from Quirk’s Players’ 2014 musical, Curtains, which plays this weekend in the G. Ray Bodley High School Auditorium.